DISHING THEM OUT Christopher Dutka prepares delivery orders of beef stew at Christopher's Kitchen in Hamilton Square. MAUREEN BIRCKS has a hard time getting dinner on the table. Not only does she hate to cook, she can barely scrape together enough time to peel a potato. Whole wheat pasta with shrimp, tomatoes and asparagus from Christopher's Kitchen. Enter Dinner by Design of Mount Laurel, whose owner, Ryan Carnall, 29, prepares and delivers meals to customers’ homes, ready for the oven or microwave. 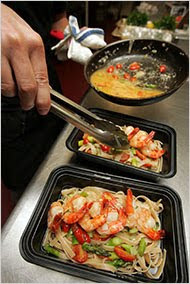 Dinner by Design, which opened in 2006, is one of several New Jersey companies that provide made-to-order meals delivered to customers’ homes. Some, Dinners by Design included, also let clients assemble their own take-home meals using the ingredients and equipment provided. Some do full-scale traditional catering as well. From the perspective of customers, even though the dismal economy has caused many to take a hard look at their food budgets, the cost of meal delivery makes a certain sense. “This service really saves me financially, because I don’t have to go out and buy all the special sauces and spices” that Mr. Carnall might use in a dish like shrimp Alfredo, said Karen McCallson, 48, a mortgage company executive who lives in Mount Laurel and is another Dinner by Design customer. “I’m also saving because I don’t have to leave work to go to the grocery store,” she said. Dinner by Design offers a package of six entrees, each serving four to six people, for $140; side dishes are extra, and there is a charge for delivery beyond a radius of roughly nine miles. At DinnerSmith, a Maplewood-based service, Fran Valle, a co-owner, said most families spend less on a delivered dinner than they might at a chain restaurant. “With us, you’re getting an entree, a starch side and a vegetable side that will feed four people with good appetites for $27,” Ms. Valle said. That figure does not include delivery charges, which apply to any orders of fewer than 20 meals delivered to a single location. The meal-delivery business may have gotten a boost from Fresh Direct, which started in New York in 2002 and expanded into parts of Jersey City, Hoboken and Weehawken in 2005. It calls itself an online grocer, but the company also delivers single-portion microwave-ready meals, like balsamic-roasted seitan ($7.99) and garlic-chili wild Alaskan halibut with coconut rice ($9.99). Suburbanites beyond Fresh Direct’s delivery area have sought other alternatives to takeout pizza or the frenzied early-evening swing by the supermarket, in spite of the cost. Heidi Facchini, 42, a nursing administrator from Clark, is among them. Since 2007, Ms. Facchini has counted on Lilia Daly, a Cranford-based personal chef who rents commercial kitchen space from St. Bartholomew’s Church in Scotch Plains, to deliver several nights’ worth of prepared meals for her family each week. Because Ms. Facchini and her husband both work, time to make dinner for themselves and their two children, ages 5 and 6, is scarce. There are also health issues: she and her husband have hypertension, which requires them to limit their salt intake. And their son is diabetic. Ms. Daly, 54, formerly a chef at the Hilton Short Hills and Café Panache in Ramsey, said clients with special dietary needs are a mainstay in her business, which serves a wide swath of central New Jersey. Like Ms. Facchini, many of her clients work in health care. “A lot of times people will call me wanting to buy dinners for someone who’s just gotten out of the hospital,” Ms. Daly said. “Or the children of an elderly couple will call me and say, ‘I’m worried they’re not eating right. After specifying for the family what will go into the dishes she might bring to such a couple — seafood paella is a specialty, but she also prepares simpler meals — Ms. Daly then settles on the quantity to be delivered and a schedule. A dozen single-serving entrees for $210, and a $15 delivery fee, is a popular option. The meals are fully cooked and just need to be reheated; they can also be frozen. Ms. Daly, who started Fresh Daly in 2004, said her business is picking up after a sharp drop when the economy took a nosedive last year. But she supplements her income by catering. So does Christopher Dutka, owner of Christopher’s Kitchen. It is something of a misnomer; Mr. Dutka, 38, who lives in Freehold, actually cooks in a rented 2,000-square-foot space at Jack’s Cafe, a Hamilton Square restaurant. Formerly a team leader in prepared foods at several Whole Foods stores, he decided to open his own business when customers there started asking him to cater their events. But in 2007, when Mr. Dutka opened Christopher’s Kitchen, his clients were split between those who wanted party catering and those who were looking for regularly delivered dinners. “So many people don’t know what to do in the kitchen — they get overwhelmed or flustered or, they don’t have time,” Mr. Dutka said recently from a table at Jack’s Cafe. 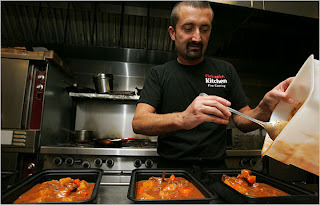 Now his business is about 40 percent catering and 60 percent meal delivery, to about a dozen regular clients in Monmouth, Mercer, Middlesex and Ocean Counties; a package of three entrees for two people, including options like miso salmon with wok-fried vegetables or saffron orzo with shrimp, costs $170, with a delivery fee for any location more than 20 miles from his kitchen. The meals are fully cooked, ready to be reheated. Some companies evolve into delivery through demand. The partners behind the 800-square-foot kitchen studio DinnerSmith had no intention of bringing their food to others when they opened in May 2007. The company’s initial focus, as at Dinner by Design, was on guiding customers through the assembly of their own meals on site. As the shop’s reputation grew, though, so did clients’ demands, according to Ms. Valle, 57, of Maplewood, and her sister Sharon Grey, 54, of Springfield, who own Dinner-Smith with their friend Mary Meade Smith, 52, of South Orange. “Once people started coming in and found out our food is good and fresh, they didn’t want to do the work anymore,” Ms. Grey said recently. The meals are preassembled and delivered ready to be cooked; DinnerSmith has no facilities for cooking, only for prepping. DinnerSmith’s business is now more than 50 percent pickup orders and deliveries to Maplewood and surrounding towns, Ms. Grey said. A six-meal package of dinners ready to be cooked costs $150, not including the delivery fee; each meal serves four to six. “People will call us from the train and say, ‘What do you have?’ ” Ms. Grey said. I think its good idea at present day usage of product …..